The work of agricultural researchers and development workers in Africa has the potential to significantly improve the lives of the poor. But that potential can only be realized with easy access to high-quality data and information. 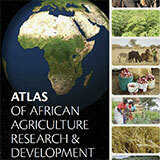 The Atlas of African Agriculture Research & Development highlights the ubiquitous role of smallholder agriculture in Africa; the many factors shaping the location, nature, and performance of agricultural enterprises; and the strong interdependencies among farming, natural-resource stocks and flows, and the well-being of the poor.